"SUV" redirects here. For other uses, see SUV (disambiguation). Sport utility vehicle (SUV) is a category of motor vehicles which combine elements of road-going passenger cars with features from off-road vehicles, such as raised ground clearance and four-wheel drive. There is no commonly agreed definition of an SUV, and usage varies between countries. Some definitions claim that an SUV must be built on a light truck chassis, however broader consider that any vehicle with off-road design features is an SUV. Crossover SUV is defined as an SUV built with a unibody construction (as per passenger cars), however in many cases crossovers are simply referred to as SUVs. In some countries— such as the United States— SUVs have been classified as "light trucks", resulting in more lenient regulations compared to passenger cars. The predecessors to SUVs date back to military and low-volume models from the last 1930s, and the four-wheel drive station wagons / carryalls that began to be introduced in 1949. The 1984 Jeep Cherokee (XJ) is considered to be the first SUV in the modern style. Most SUVs produced today use unibody contruction (as per passenger cars), however in the past many SUVs used body-on-frame construction. During the late 1990s and early 2000s, the populary of SUVs greatly increased, often at the expense of the popularity of large sedans and station wagons. More recently, smaller SUVs and crossovers have become increasingly popular. SUVs are currently the world's largest automotive segment and accounted for 36.8% of the world's passenger car market in 2017. There is no universally accepted definition of the sport utility vehicle. Dictionaries, automotive experts, and journalists use varying wordings and defining characteristics, in addition to which there are regional variations of the use by both the media and the general public. The auto industry has not settled on one definition of the SUV either. The actual term "Sport Utility Vehicle" did not come into wide popular usage until the late 1980s — prior to then, such vehicles were marketed during their era as 4-wheel drives, station wagons, or other monikers. 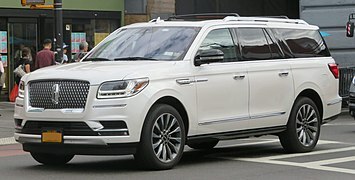 Automotive websites descriptions of SUVs range from specifically "combining car-like appointments and wagon practicality with steadfast off-road capability" with "chair-height seats and picture-window visibility" to the more general "nearly anything with available all-wheel drive and raised ground clearance". It is also suggested that the term SUV has replaced "jeep" as a general term for off-road vehicle. "rugged automotive vehicle similar to a station wagon but built on a light-truck chassis"
"automobile similar to a station wagon but built on a light truck frame"
"large vehicle that is designed to be used on rough surfaces but that is often used on city roads or highways"
"passenger vehicle similar to a station wagon but with the chassis of a small truck and, usually, four-wheel drive"
In British English, the terms "four-by-four" (often abbreviated to "4x4") or "off-road vehicle" are generally used instead of sport utility vehicle. The Collins English Dictionary defines sport(s) utility vehicle as a "powerful vehicle with four-wheel drive that can be driven over rough ground" or "a high-powered car with four-wheel drive, originally designed for off-road use", but the citations quoted by Collins are few. The Chambers Dictionary has no entry for sport utility vehicle. In Europe, the term SUV is generally used for road-oriented vehicles, "four-by-four" or the brand name of the vehicle are typically used for off-road oriented vehicles. Similarly, in Australia and New Zealand, vehicles designed for off-road use are typically referred to as "four-wheel drives" instead of SUVs. In the United States, many government regulations simply have categories for "off-highway vehicles" which are loosely defined and often result in SUVs (along with pick-up trucks and minivans) being classified as light trucks. For example, Corporate Average Fuel Economy (CAFE) regulations previously included "permit greater cargo-carrying capacity than passenger carrying volume" in the definition for trucks, resulting in SUVs being classified as light trucks. This classification as trucks allowed SUVs to be regulated less strictly than passenger cars under the Energy Policy and Conservation Act for fuel economy, and the Clean Air Act for emissions. However, from 2004 onwards, the United States Environmental Protection Agency (EPA) began to hold sport utility vehicles to the same tailpipe emissions standards as cars. In 2011 the CAFE regulations were changed to classify small, two-wheel drive SUVs as passenger cars. However the licencing and traffic enforcement regulations in the United States vary from state to state, and an SUV may be classified as a car in some states but as a truck in others. For industry production statistics, SUVs are counted in the light truck product segment. In India, all SUVs are classified in the "Utility Vehicle" category per the Society of Indian Automobile Manufacturers (SIAM) definitions and carry a 27% excise tax. Those that are 4 metres (157 inches) long, have a 1,500 cc (92 cu in) engine or larger, along with 170 mm (6.7 in) of ground clearance, are subject to a 30% excise duty. In Australia, SUV sales were helped by having lower import duties than passenger cars. Up until January 2010, SUVs were subject to a 5% import tarif, compared with 10% for passenger cars. Many years after most passenger cars had transitioned to a unibody construction, most SUVs continued to use a separate body-on-frame method, due to being based on the chassis from a light truck, commercial vehicle, pickup truck or off-road vehicle. The first mass-produced unibody four-wheel drive passenger car was the 1955 GAZ-M20 Pobeda M-72. The 1977 Lada Niva was the first off-road vehicle to use both a unibody construction and a coil-sprung independent front suspension. The relatively compact Niva is considered a predecessor to the crossover SUV and combines a hatchback-like passenger car body with full-time four-wheel drive, low-range gearing and lockable center differential. Nonetheless, unibody SUVs remained rare until the 1984 Jeep Cherokee (XJ) was intruduced and became a sales success. The introduction of the 1993 Jeep Grand Cherokee resulted in all Jeep SUV models using unibody construction, with many other brands following suit since the mid-1990s. Today, most SUVs in production use a unibody construction and relatively few models continue to use a body-on-frame construction. SUVs are typically of a two-box design similar to a station wagon. The engine compartment is up front, followed by a combined passenger/cargo area (unlike a sedan, which has a separate trunk/boot compartment). Up until approximately 2010, many SUV models were available in 2-door body styles. Since then, manufacturers began to discontinue the 2-door models as 4-door models became more popular. Only a few 2-door SUVs remain today, such as the body-on-frame Suzuki Jimny and Jeep Wrangler, and the Range Rover Evoque crossover SUV. SUVs typically have high ground clearance and a tall body. This results in a high centre of mass, which makes SUVs more prone to roll-over accidents. In 2003, SUVs were quoted as 2.5 times more likely to roll over in a crash than regular cars and that SUV roofs are more likely to cave in on passengers than in other cars, resulting in increased harm to passengers. Between 1991 and 2001, the United States saw a 150% increase in sport-utility vehicle rollover deaths. In 2001, though roll-overs constituted just 3% of vehicle crashes overall, they caused over 30% of occupant fatalities in crashes; and in crashes where the vehicle does roll over, SUV occupants in the early 2000s were nearly three times as likely to be killed as other car passengers. The increasing popularity of SUVs in the 1990s and early 2000s was partly due to buyers perceiving that SUVs provide greater safety for occupants, due to their larger size and raised ride height. Regarding the safety to other road users, SUVs are exempted from the regulation that a passenger car bumper must protect the area between 16 to 20 inches (41 to 51 cm) above the ground. This often increases the damage to the other car in a collision with an SUV, because the impact occurs at a higher location on the other car. In 2000-2001, 60% of fatal side-impact collisions were where the other vehicle was an SUV, an increase from 30% in 1980-1981. The 'crossover SUV' segment (also known as 'CUV' or simply 'crossover') has become increasingly popular since around 2010. The difference between crossovers and other SUVs is sometimes defined as a crossover being built using a unibody platform (the type used by most passenger cars), while an SUV is built using a body-on-frame platform (the type used by off-road vehicles and light trucks). However, these definitions are often blurred in practice, since unibody vehicles are also often referred to as SUVs. Also, crossover is a relatively recent term and early unibody SUVs (such as the 1984 Jeep Cherokee) are rarely called crossovers. Due to these inconsistencies, the term SUV is often used as a catch-all for both crossovers and SUVs. Outside of the United States, the term crossover tends to be used for C-segment (compact) or smaller vehicles, with large unibody vehicles— such as the Audi Q7, BMW X7 and Volkswagen Touareg— are usually called SUVs rather than crossovers. In the United Kingdom, a crossover is sometimes defined as a hatchback model with raised ride height and SUV-like styling features. A mini SUV (also called subcompact SUV or subcompact crossover) is a class of small sport utility vehicles. The term usually applies to crossovers based on a supermini (B-segment cars in Europe) platform. Compact SUV is the next bigger size class after mini SUVs. Some compact SUVs are built on the platforms of Compact/C-segment passenger cars, while others are built on dedicated platforms. A mid-size SUV is a class of medium-size SUVs whose size typically falls between that of a full-size and a compact SUV. This term is not commonly used outside North America, where fullsize and midsize SUVs are considered similar. Full-size SUVs are the second largest size of SUVs. Some are marketed for their off-road capabilities, while others are marketed as luxury vehicles. An extended length SUV is a long-wheelbase version of a full-size SUV, with greater space for rear passengers or cargo. Extended-length SUVs are currently produced solely in the United States and are mostly sold in North America and the Middle East. Just before and during World War II, around the world, prototypes and low-volume production examples began to appear of cars with sedan or station-wagon type bodies on rugged, off-road capable four-wheel drive chassis, such as the 1936 Kurogane Type 95 from Japan, the 1938 GAZ-61 from Russia and the 1941 Volkswagen Kommandeurswagen from Germany. An early predecessor to the design of modern SUVs, was the 1940 Humber Heavy Utility, a four-wheel drive off-road vehicle built on the chassis of the Humber Super Snipe passenger car. One of the most prohibitive initial factors to the potential civilian market popularity of an SUV-like car lay in its costs, and availability of certain critical parts. Before the war, adding four-wheel drive to a car almost doubled its cost, Compared to a common, rear-wheel drive vehicle, any 4WD needed a number of essential extra components, like a transfer case, and a second differential and constant-velocity joints for the driven front axle — all expensive components, because of the precision involved in manufacturing gears and such. In America these were produced up to the war only by a few specialized firms with limited capacity, but due to the war's necessity, from spring 1942 Ford, Dodge and Chevrolet joined in fabricating these parts in mass quantity, boosting their production more than 100-fold. An early usage of the term was the 1947 Crosley CC Four Sport Utility model, which used a convertible wagon body style and is therefore unrelated to the design of later SUVs. Several models of carryall wagons began to be offered with four-wheel drive, beginning in 1949 when the Willys Jeep Station Wagon introduced the option of four-wheel drive. This four-wheel drive version of the Willys Jeep is often credited with being the first SUV. Four-wheel drive versions of the Chevrolet Suburban were introduced for 1955, followed by the International Harvester Travelall in 1956 (credited as being the first full-size SUV) and the Power Wagon Town Wagon in 1957. For 1963, the Jeep Wagoneer (SJ) replaced the Willys Jeep Station Wagon. The Wagoneer was the first luxury four-wheel drive vehicle, included many car-like features and has been credited as being "the progenitor of the popular sport utility vehicle" and "the first modern sport utility vehicle". The 1967 Toyota Land Cruiser FJ55 station wagon was the first comfort-oriented version of the Land Cruiser off-road vehicle. The two-door Chevrolet K5 Blazer (and related GMC K5 Jimmy) were introduced for 1969 and the two-door International Harvester Scout II was introduced in 1971. The first European luxury off-road vehicle was the 1970 Range Rover Classic, which was marketed as a luxury car for both on-road and off-road usage. The first relevant usage of the term SUV was advertising brochures for the 1974 Jeep Cherokee (SJ), which used the wording "sport(s) utility vehicle" as a description for the vehicle. The 1966 Ford Bronco included a "sport utility" model, however in this case it was used for the two-door pickup truck version. The 1979 AMC Eagle is considered by some to be the first crossover. 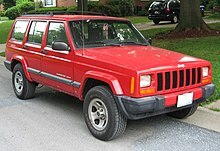 The 1984 Jeep Cherokee (XJ) is often credited as the first SUV in the modern understanding of the term. The use of unibody construction was unique at the time for a four-wheel drive, and reduced the weight of the Cherokee. It also appealed to urban families due to having a more compact size (compared to the full-size Wagoneer) as well as a plush interior resembling a station wagon. As the Cherokee became a major sales success, the term "sport utility vehicle" began to be used in the national press for the first time. "The advent and immediate success of AMC/Jeep's compact four-door Cherokee turned the truck industry upside down." The corporate average fuel economy (CAFE) standard that was introduced in 1975 with the aim of reducing fuel usage included relaxed regulations for "light trucks", to avoid business paying extra taxes for work vehicles. This created a loophole which manufacturers increasingly exploited since the 1980s, whereby SUVs were designed to be classified as light trucks (despite their primary use as passenger vehicles) to receive tax concessions and less stringent fuel economy requirements. For example, the United States Environmental Protection Agency agreed to classify the Jeep Cherokee as a light truck following lobbying from its manufacturer; the Cherokee was then marketed by the company as a passenger vehicle. This increased the SUV boom as other manufacturers introduced their own SUVs in response to the Cherokee taking sales from their regular cars. SUVs increased in popularity throughout the 1990s and by 1999 the U.S. sales of SUVs and light trucks for the first time exceeded sales of regular passenger cars. The 1996 Toyota RAV4 is considered by some to be the first crossover. By 2003 there were 76 million SUVs and light trucks on U.S. roads, representing approximately 35% of the vehicles on the road. Car manufacturers were keen to promote SUV sales over other types of cars due, to higher profits in the segment. An SUV could be sold with a profit margin of US$10,000 or more (US$18,000 per SUV in the case of the Ford Excursion), while compact cars were often sold at a loss of a few hundred dollars per car. As a result, several manufacturing plants were converted from car production to SUV production (such as the General Motors Arlington, Texas plant in 1996) and many long-running U.S. sedan models were discontinued. From the mid-2000s until 2010, U.S. sales of SUVs and other light trucks experienced a dip, due increasing fuel prices and a declining economy. From 20008 to 2010, General Motors closed four assembly plants that were producing SUVs and trucks. Sales of SUVs and light trucks sales began to recover in 2010, as fuel prices decreased and the North American economy improved. By 2013, small and compact SUVs had increased to become the third largest market segment. Since the early 2000s, new styles of SUV have been introduced to appeal to a wider audience, such as crossovers and other small SUVs. Larger SUVs also remained popular, with sales of General Motors' large SUV models increasing significantly in 2013. In 2015, global sales of SUVs overtook the "lower medium car" segment, to become the largest market segment, accounting for 22.9% of "light vehicle" sales in 2015. The following year, worldwide SUV sales experienced further growth of 22%. The world's fastest growing SUV markets in 2014-2015 were: China (+ 47.9%), Italy (+ 48.6%), Spain (+ 42%), Portugal (+ 54.8 %) and Thailand (+ 56.4%). The SUV segment further grew to 26% of the global passenger car market in 2016, then to 36.8% of the market in Q1–Q3 of 2017. In the US, at the end of 2016, sales of SUVs and light duty trucks had surpassed traditional car sales for the year by over 3 million units. Manufacturers continued to phase out production of sedan models, replacing them with new models of SUVs. Luxury brands have increasingly introduced SUV or crossover models in the 2010s, such as the seven models of SUVs (X1 through X7) sold by BMW, the Rolls-Royce Cullinan, Bentley Bentayga and Lamborghini Urus. Ferrari have announced that they will release an SUV model in 2022. SUVs have competed in various off-road racing competitions, such as the Dakar Rally, Baja 1000, FIA Cross-Country Rally World Cup, King of the Hammers and Australasian Safari. SUVs have also competed in the Trophee Andros ice-racing series. Several derogatory/pejorative terms for SUVs are based on the combination of an affluent suburb name and "tractor", particularly for expensive vehicles from luxury brands. Examples include "Toorak Tractor" (Melbourne, Australia), "Chelsea Tractor" (London, England) and "Remuera Tractor" (Auckland, New Zealand). These terms relate to the theory that four-wheel drive capabilities are not required by affluent SUV owners and that the SUV is purchased as a status symbol rather than for practical reasons. In Norway, the term "Børstraktor" (Stock Exchange Tractor) serves a similar purpose. In the Netherlands, SUVs are sometimes called "P.C. Hooft-tractors" after the exclusive P.C. Hooftstraat Amsterdam shopping street. Wikimedia Commons has media related to Category:SUVs. ^ a b c Bradsher, Keith (2002). High and Mighty: SUVs—The World's Most Dangerous Vehicles and How They Got That Way. PublicAffairs. p. 4. ISBN 978-1-58648-203-9. ^ a b Bumbeck, Mike (August 2013). "Utility in Style - 1972 Jeep Wagoneer The 1972 Jeep Wagoneer blends an iconic design with modern driveability". Hemmings Classic Car. Retrieved 10 January 2018. ^ DeMuro, Doug (October 2013). "SUV vs. Crossover: What's the Difference?". Autotrader. Retrieved 12 January 2018. ^ Glucksberg, Sam (2001). Understanding Figurative Language: From Metaphor to Idioms. Oxford University Press. p. 112. ISBN 9780198027126. Retrieved 12 January 2018. ^ "Definition of SUV". www.merriam-webster.com. Retrieved 7 April 2019. ^ "Definition of SUV". Merriam-Webster. Archived from the original on 5 January 2018. Retrieved 12 January 2018. ^ Webster’s New World College Dictionary, 4th Edition. Houghton Mifflin Harcourt. ^ "Search Chambers: four-by-four". www.chambers.co.uk. Retrieved 7 April 2019. ^ "Search Chambers: off-road vehicle". www.chambers.co.uk. Retrieved 7 April 2019. ^ Collins Cobuild Advanced English Dictionary. ^ Collins English Dictionary. HarperCollins Publishers. ^ "Sport utility vehicle definition and meaning". Collins English Dictionary. Archived from the original on 5 January 2018. Retrieved 12 January 2018. ^ "Search Chambers: sport utility vehicle". www.chambers.co.uk. Retrieved 7 April 2019. ^ Davis, Stacy C.; Williams, Susan E.; Boundy, Robert G. (2016). "Transportation Energy Data Book" (PDF) (35th ed.). US: Oak Ridge National Laboratory. pp. 3–5. Retrieved 11 February 2019. ^ Fuhs, Allen (2008). Hybrid Vehicles: and the Future of Personal Transportation. CRC Press. p. 263. ISBN 9781420075342. Retrieved 8 April 2019. ^ Yacobucci, Brent D. (17 April 2003). "Sport Utility Vehicles, Mini-Vans, and Light Trucks: An Overview of Fuel Economy and Emissions Standards" (PDF). CRS Report for Congress. Archived (PDF) from the original on 16 August 2017. Retrieved 23 December 2011. ^ "The Plain English Guide to the CleanAirAct" (PDF). United States Environmental Protection Agency. April 2007. p. 8. Retrieved 6 December 2017. ^ "Fact #726: SUVs: Are They Cars or Trucks?". Office of Energy Efficiency & Renewable Energy (EERE). U.S. Department of Energy. 7 May 2012. Archived from the original on 12 January 2014. Retrieved 12 January 2014. ^ Fuhs, Allen (2008). Hybrid Vehicles: and the Future of Personal Transportation. CRC Press. p. 7. ISBN 9781420075342. Retrieved 6 December 2017. ^ a b "Production of Small and Compact SUVs Shifts to Top Gear in North America, Finds Frost & Sullivan". prnewswire.com. 14 January 2014. Retrieved 14 January 2014. ^ Bhattacharya, Sindhu (20 December 2013). "Budget 2013: Why SUV found special mention this budget day". Firstpost. Retrieved 6 December 2017. ^ Press Trust of India (2 May 2013). "SUV tax creating uneven playing field: Mahindra". NDTV. Retrieved 6 December 2017. ^ "Tariff reduction will soften price rises". Blog.autopeople.com.au. 18 November 2008. Archived from the original on 6 January 2009. Retrieved 16 November 2010. ^ "Matters of great import". Carpoint.com.au. 6 January 2010. Retrieved 16 November 2010. ^ "M-72 all-terrain vehicle". www.spb.ru (in Russian). Retrieved 13 April 2019. ^ Thompson, Andy (2008). Cars of the Soviet Union. Somerset, UK: Haynes Publishing. p. 57. ^ "Jeep Grand Cherokee Review". Retrieved 10 April 2011. ^ DeMuro, Doug (1 April 2013). "Attention Automakers: Please Stop Selling Two-Door SUVs". The Truth About Cars. Retrieved 23 September 2017. ^ DeMuro, Doug (June 2017). "Every Single Two-Door SUV Has Failed". Autotrader. Retrieved 23 September 2017. ^ "Toyota Sharpens Best-Selling Prado Range" (Press release). Australia: Toyota. 14 October 2013. Archived from the original on 6 March 2016. Retrieved 17 March 2014. ^ Lee, Christian (2007). High-Performance Jeep Wrangler TJ Builder's Guide. CarTech. p. 14. ISBN 9781932494266. Retrieved 23 September 2017. ^ a b c d e f SUV safety : issues relating to the safety and design of sport utility vehicles : hearing before the Committee on Commerce, Science, and Transportation, United States Senate, One Hundred Eighth Congress, first session. DIANE Publishing. 26 February 2003. p. 2. ISBN 9781422334188. ^ Penenberg, Adam (2003). Tragic Indifference: One Man's Battle with the Auto Industry over the Dangers of SUVs. HarperBusiness. p. 12. ISBN 0-06-009058-8. ^ SUV safety : issues relating to the safety and design of sport utility vehicles : hearing before the Committee on Commerce, Science, and Transportation, United States Senate, One Hundred Eighth Congress, first session. DIANE Publishing. 26 February 2003. p. 18. ISBN 9781422334188. ^ "The 50 Worst Cars Of All Time". Time. 7 September 2007. Retrieved 23 May 2010. ^ Croft, Robin (2006). "Folklore, families and fear: understanding consumption decisions through the oral tradition". Journal of Marketing Management. 22 (9/10): 1053–1076. doi:10.1362/026725706778935574. ISSN 0267-257X. ^ "When cars and SUVs crash: Bumper mismatch boosts costs - Dec. 2, 2010". www.cnn.com. Retrieved 14 April 2019. ^ "Q&As – Vehicle size and weight". US: Insurance Institute for Highway Safety. April 2018. Retrieved 11 February 2019. ^ "Side-impact crash test program". Insurance Institute for Highway Safety. Archived from the original on 30 December 2010. ^ "Difference between a crossover vehicle and SUV?". www.hertzcarsales.co.uk. 30 January 2019. Retrieved 22 April 2019. ^ "What is the Difference Between Crossovers and SUVs? « Harbin Automotive". www.harbinautomotive.com. Retrieved 22 April 2019. ^ "What's the Difference Between an SUV, a Crossover, & a CUV?". www.thenewswheel.com. 30 March 2017. Retrieved 22 April 2019. ^ "SUV vs. Crossover: What's the Difference?". www.autotrader.com. Retrieved 22 April 2019. ^ "SUVs vs. Crossovers: What's the Difference?". www.usnews.com. Retrieved 22 April 2019. ^ "The Difference Between SUVs and Crossover Cars". www.carwriteups.co.uk. 9 April 2018. Retrieved 22 April 2019. ^ "What's the difference between a crossover, SUV and 4x4?". www.carbuyer.co.uk. Retrieved 22 April 2019. ^ "SUV vs Crossover: What are the Differences and Similarities?". www.leasefetcher.co.uk. Retrieved 22 April 2019. ^ "10 Strange Military Vehicles of World War II". www.wonderslist.com. 30 January 2014. Retrieved 10 April 2019. ^ Allen, Jim (10 January 2016). "Origins Of The Jeep: Birthing A 75-Year Legend". Four Wheeler Network. US. Retrieved 11 February 2019. ^ Thomson, Harry C.; Mayo, Lida (2003). The Ordnance Department: procurement and supply. Washington, D.C.: Center of Military History, U.S. Army (Originally published: 1960, Washington, D.C., Office of the Chief of Military History, Dept. of the Army). p. 274. ^ "History 101: The Crosley Automobile". Daily KOS. US. 26 May 2014. Retrieved 24 February 2018. ^ "Details on Crosley CC Models 1946 - 1948". Crosley Automobile Club. US. Retrieved 24 February 2018. ^ "Crosley 1948". Archived from the original on 23 February 2018 – via Classic Car Catalogue. ^ "1960 Willys Four-Wheel-Drive Station Wagon: Your (Great-) Grandfather's SUV". Autoweek. Retrieved 5 October 2017. ^ Greg. "The Very First Sport Utility Vehicle: The Jeep Station Wagon". autoroundup. Retrieved 6 December 2017. ^ a b Allen, Jim (1 November 2012). "1959 International Harvester B-120 Travelall – Four Wheeler Magazine". Four Wheeler Network. Archived from the original on 7 January 2018. Retrieved 7 January 2018. ^ "The 1958 Station Wagons". Changing Times: The Kiplinger Magazine. 12 (2): 22. February 1958. Retrieved 9 January 2018. ^ Foster, Patrick (January 2008). "1963 Jeep Wagoneer - Landmark Vehicle". 4 Wheel Drive & Sport Utility Magazine. Retrieved 16 November 2010. ^ "1970 range rover advert". www.youtube.com. 11 February 2018. Retrieved 13 April 2019. ^ "Old Range Rover ad". www.youtube.com. 13 June 2009. Retrieved 13 April 2019. 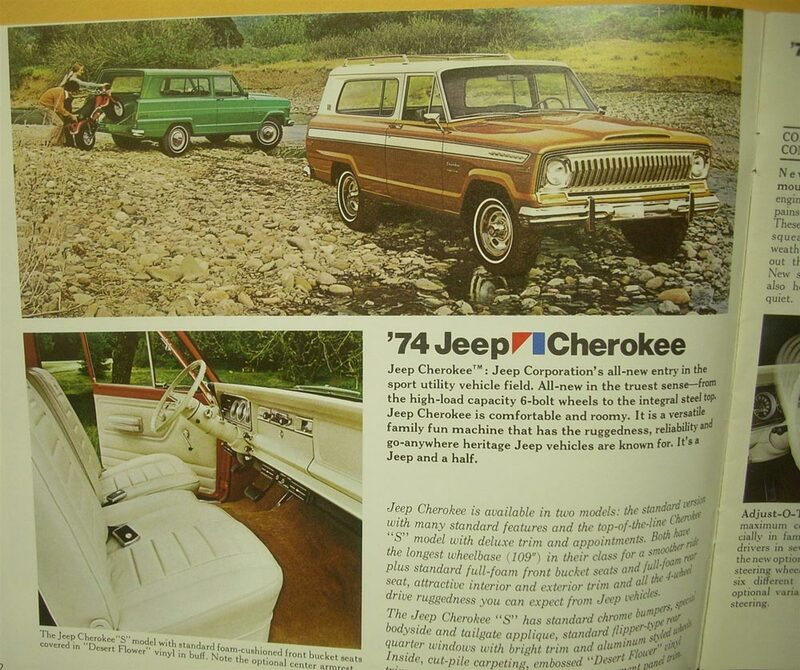 ^ "1974 model year Jeep brochure picture – Cherokee page". US: Jeep. 1973. Retrieved 4 January 2018. ^ "1974 model year Jeep Cherokee brochure – front". US: Jeep. 1973. Retrieved 4 January 2018. ^ "1966 Ford Bronco U-100 4-Wheel Drive models & features brochure". US: Ford. 1965. Retrieved 4 January 2018. ^ "Who coined the term 'crossover vehicle?'". www.howstuffworks.com. 13 July 2011. Retrieved 8 December 2018. ^ Gold, Aaron. "AMC Eagle: No, Seriously, This Was the First Crossover SUV". www.autotrader.com. Retrieved 5 July 2017. ^ a b c Bradsher, p. 40. ^ Ludel, Moses (1995). Toyota truck & Land Cruiser owner's bible. Robert Bentley. p. 18. ISBN 978-0-8376-0159-5. Retrieved 24 June 2011. ^ "From the Battlefield to the Soccer Field". Traffic Safety Center Online Newsletter. Summer 2005. Archived from the original on 10 March 2012. Retrieved 8 January 2013. ^ Bradsher, Keith (2002). High and Mighty: SUVs—The World's Most Dangerous Vehicles and How They Got That Way. PublicAffairs. ISBN 978-1-58648-203-9. ^ Madrigal, Alexis C. (10 July 2014). "Why Crossovers conquered the American Highway". The Atlantic. US. Retrieved 6 July 2017. ^ Schoenberger, Robert (6 June 2008). "As buyers shun SUVs, expect to pay more for that small car". Cleveland Business News. Retrieved 16 November 2010. ^ "Ford idle, for now". USA Today. 16 October 2008. Retrieved 23 May 2010. ^ White, Jerry (27 May 2000). "GM, Ford idle 1,365 workers-auto industry layoffs signal coming downturn in US economy". Wsws.org. Retrieved 16 November 2010. ^ Maynard, Micheline (28 October 2006). "End of the Line for Ford Taurus". The New York Times. Retrieved 15 March 2018. ^ Final Ford Taurus interview. ABC News. 26 July 2007. ^ "So long, friend. Ford producing last Taurus next week". Autoblog. Retrieved 26 July 2007. ^ Van Praet, Nicolas (4 June 2008). "Caw Girds For War". Financial Post. US. Archived from the original on 16 February 2009. Retrieved 11 February 2019. ^ Healey, James (30 July 2010). "Surprise: Sales of big SUVs surging faster than small cars". USA Today. Retrieved 23 April 2012. ^ a b c d "SUVs Become the Largest and Fastest-Growing Automotive Segment in 2015". Euromonitor International. 8 September 2016. Archived from the original on 6 August 2017. Retrieved 5 January 2018. ^ Wayland, Michael (14 September 2013). "2015 GMC Yukon and Chevy Suburban, Tahoe: GM expects new SUVs to continue industry dominance". MLive. US. Retrieved 11 February 2019. ^ "World Best Selling SUV 2016". Focus2Move. 25 January 2017. Archived from the original on 29 January 2017. Retrieved 6 January 2018. ^ "World Best Selling SUV 2017". Focus2Move. 29 November 2017. Archived from the original on 6 January 2018. Retrieved 6 January 2018. ^ "Auto Sales December 2016 compared to 2015". Wall Street Journal. 4 January 2017. Archived from the original on 5 January 2017. ^ "Hyundai Trims Fat, Looks to Add More SUVs to Lineup". suvs.com. 17 January 2017. ^ "BMW X Models | New Vehicles". UK: BMW. Retrieved 21 March 2019. ^ "The Australian travel slang dictionary". Australian Traveller. Australia. 9 June 2015. Retrieved 18 February 2018. ^ "The evolution of the SUV". eMotor. 3 January 2018. Retrieved 18 February 2018. ^ Campbell, Denis (26 September 2004). "Terminator guns for the Chelsea Tractor". The Guardian. London. Retrieved 19 July 2009. ^ Sæter, Embret (26 November 2009). "Bloddopet børstraktor" (in Norwegian). DN.no. Retrieved 2 January 2012. ^ Nizet, Rik (14 January 2014). "Lamborghini lanceert ook PC Hooft-tractor" [Lamborghini also launches a PC Hooft-tractor]. De Ondernemer (The Entrepreneur) (in Dutch). De Persgroep. Retrieved 17 February 2018.